Peter Larkin speaks at the ROFDA Fall Conference in Arizona. The 2018 mid-term elections changed the makeup of Congress, with 100 new members who took office in January. 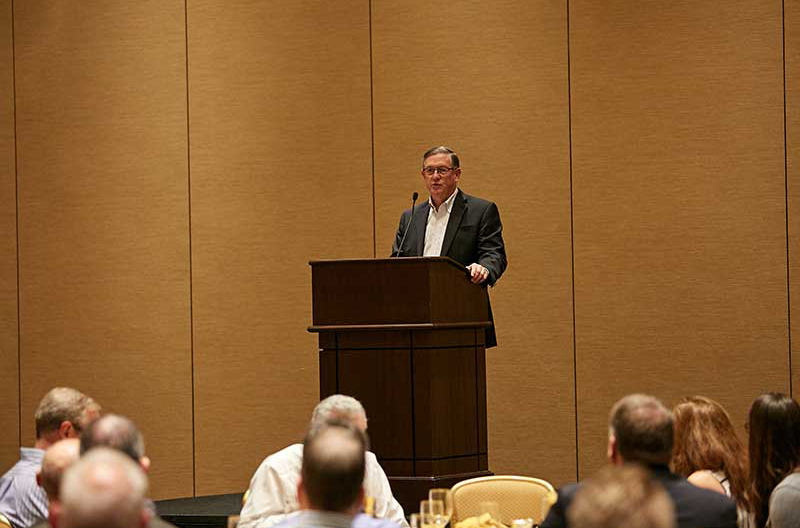 National Grocers Association (NGA) President Peter Larkin told the grocers in attendance at the November 2018 ROFDA Fall Conference in Arizona to invite these new members to their stores and talk about the issues impacting them on a daily basis. “With 100 new members of Congress who haven’t had to deal with any issues, let alone our industry issues, now is the time to forge those relationships,” he said. Larkin noted the diversity of the new Congress is much stronger than before, including the fact of many more women being elected than in the past. He said NGA’s Political Action Committee supported more than 50 candidates who were supportive of the association’s issues. Of those candidates, 87 percent were re-elected. Larkin spoke of issues of concern to the industry in the lame duck session of Congress. In what has come to be an accurate prediction, Larkin also mentioned watching for the possibility of a government shutdown, as a portion of the government was only funded through Dec. 9. Larkin said with changes in the House, the next Congress should take action on paid family leave. He also predicted there would be activity on the issue of minimum wage. On the issue of reforms to payment systems, Larkin noted that Maxine Waters will be the new chair of the House Financial Services Committee. Larkin said a much-talked-about infrastructure bill could be very important to the grocery industry. “Former Transportation Secretary Ray LaHood just came out urging the president to support a modest increase in the gas tax to be able to fund that, so we’ll see how that goes,” Larkin said. Health care is another area where there may be some cooperation between Congress and the president, Larkin said, particularly in the area of reducing costs of prescription drugs. On the issue of trade and regulations, Larkin said he thought most people in the grocery industry would agree that over the last two years they have been successful in rolling back some regulations that have been harmful to the industry. The new House will be made up of more conservatives on the Republican side and more liberals on the Democratic said, Larkin said. “Does that bode well for cooperation? Theoretically, no, but hopefully good sense will prevail,” he said. The 116th U.S. Congress convened Jan. 3.